Almost a month ago I became paralyzed. As a single mother of two young daughters this was terrifying. The pain was so great that if I attempted to stand I would black out. I could only walk by leaning my entire body into some one else and being essentially shuffle/dragged to where I needed to go. Picking me up completely caused too much pain and intense back spasms. I ended up needing an ambulance twice, a variety of medication and treatment after I was discharged from the hospital and was only conscious for a few hours a day. I was incapable of working and was suddenly completely dependent on others. Fortunately my insurance covered most of it and my business is set up to mostly still run without me. However, it made me realise I am not very well prepared for medical emergencies. 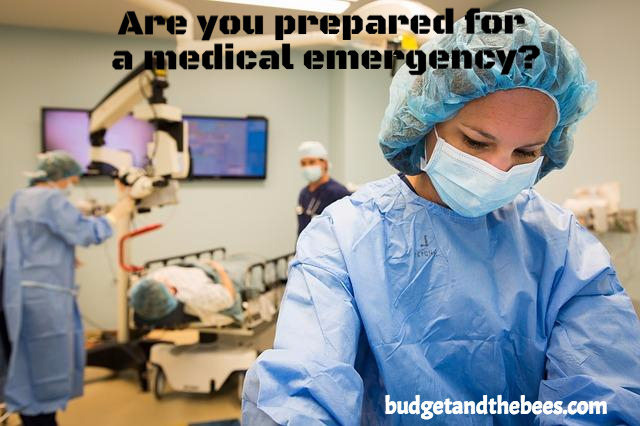 How can you be prepared for medical emergencies? Depending on your employment contract, you probably get it through work. Always check what you are covered for and ensure you are adequately covered. Some choose to ‘self insure’, that is save the money they would spend on insurance for emergencies. Given the expense of something like a car accident which is outside your control but can have longterm consequences to your health, it is not something I would recommend. One of the things this experience made me realise was that my children, while they know how to call emergency, would not have been able to because my phone is locked and I only have a mobile, not a home phone. If I didn’t have my best friend here when it happened, my kids could not have called an ambulance. When I was up to it we sat down and discussed our emergency plans. We now have a step by step plan stuck on the back of the door including who they can call, what our address is, my phone number and other details I felt they needed to know. On top of teaching my kids, I worked out other arrangements, such as a list of people who can step in to help if needed to pick my kids up from school, have them sleep over, run errands if needed etc. I now have an extensive plan for a variety of emergency scenarios. While insurance covered a lot, there were some things that were still out of pocket expenses, not to mention the potential loss of income. An emergency fund is always a good idea anyway. If you don’t have one, aim to get even $1,000 asap! You can do this by selling off things, cutting out things like eating out, coffees and cable to build your fund quickly. While in this situation I was the one needing help, it did make me think I have not done a first aid course in a long time. I know the basics, but in a real medical emergency, I would probably be useless. When is the last time you learnt first aid? I don’t have much of a first aid kit. I have a few band aids, pain killers and bandages but that was all. Get some supplies to have on hand should you need them. Even a basic first aid kit is better than no kit. What would you recommend when planning for medical emergencies? Aside from insurance, I think emergency fund is necessary and readiness with regard to psychological and mental is as well important. Just last February, I and my wife enrolled in a class where we were taught about first aid. We learned how to help someone who is choking, how to treat a burn, what to do if someone is bleeding heavily from a wound, and how to treat a sprain or strain.